I did this invitation because my super cool nephews were going to throw a party, but the weekend they planned it their school band went out of town and the next weekend another one of their buddies had a party so they ended up canceling so people wouldn't have to decide what party to go to... 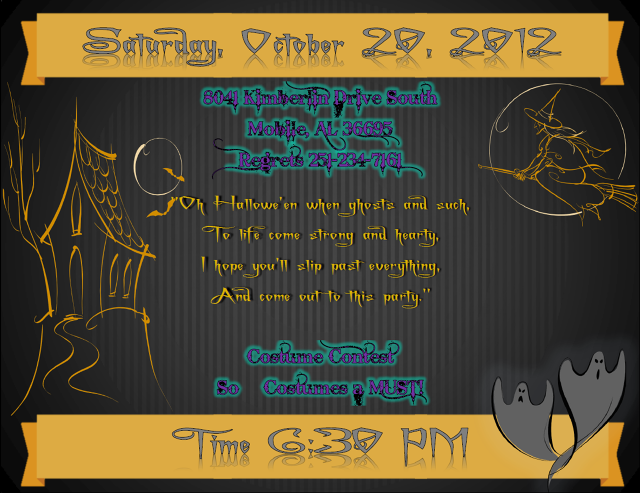 BUT before everything went sour I made them a really cool invitation. I've had a really great time making invitations lately and I hope that I can do a few more soon. Well I hope everyone has a wonderful fall and a fun safe Halloween, and remember to savor this weather because (at least in my case) it doesn't last for long. LONG LIVE CUTE BOOTS AND SCARVES! This is something that I worked on for one of my sister's dearest friends. I found some fantastic fonts and had fun playing with lace textures and experimenting with Parisian colors and emotions. I think this came out cute, chic, and playful. I hope to do more invitations in the future this was a fun experience. I am a freelance artist (digital & traditional) and I live in Mobile Alabama. I have a degree in Digital Media from Full Sail University - I can do commissioned paintings, wall murals, lettering, photo editing and manipulation, logo and layout design as well as many other art forms. I use a lot of different mediums and my style tends to vary more than I would like it to. Most of my work tends to have a natural theme, but I am open to exploring just about any subject matter or theme no matter how crazy.